Hans-Georg Kaetner a good friend of mine was born in Magdeburg, Germany, but lives here in Basel. He is an 83 yr old Travel Writer (has visited more than 70 countries) of several books and has held more than a thousand sessions of book launching and presentations around the world. 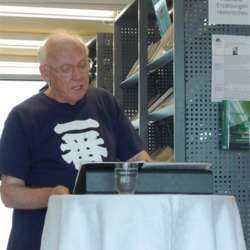 He is going to read from one of his interesting books titled „Auswegs Karatschi“ on this very evening. The book is in German. He will read some chapters at the beginning as we enjoy an apero and snacks and then we shall have dinner (a buffet with rich healthy foods) and later he shall do the last reading to wind up the evening. You will ask him questions at the end. Come let us mingle, learn from this wise man and enjoy the evening together. 29 Fr includes a copy of his book, dinner, snacks and some soft drinks.